In collaboration with Noël Coye, Conservateur du patrimoine, Ministère de la Culture et de la Communication, France. Lascaux is famous for its Palaeolithic cave paintings, found in a complex of caves in the Dordogne region of southwestern France, because of their exceptional quality, size, sophistication and antiquity. Estimated to be up to 20,000 years old, the paintings consist primarily of large animals, once native to the region. Lascaux is located in the Vézère Valley where many other decorated caves have been found since the beginning of the 20th century (for example Les Combarelles and Font-de-Gaume in 1901, Bernifal in 1902). Lascaux is a complex cave with several areas (Hall of the Bulls, Passage gallery) It was discovered on 12 September 1940 and given statutory historic monument protection in december of the same year. In 1979, several decorated caves of the Vézère Valley - including the Lascaux cave - were added to the UNESCO World Heritage Sites list. But these hauntingly beautiful prehistoric cave paintings are in peril. 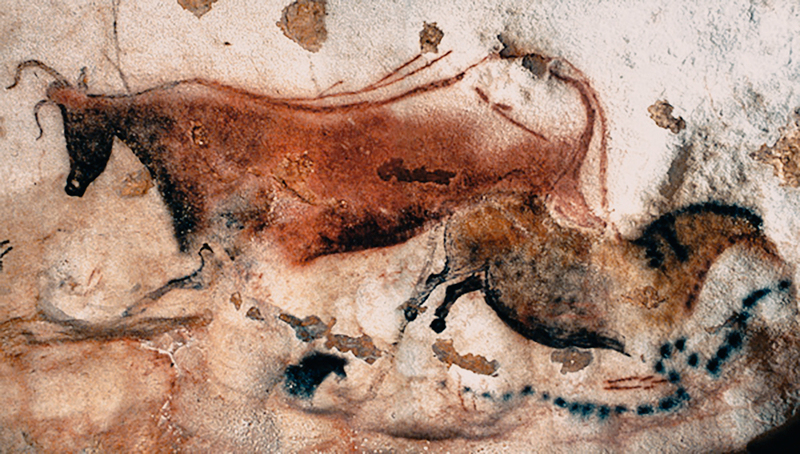 Recently, in Paris, over 200 archaeologists, anthropologists and other scientists gathered for an unprecedented symposium to discuss the plight of the priceless treasures of Lascaux, and to find a solution to preserve them for the future. The Symposium took place under the aegis of France's Ministry of Culture and Communication, and presided over by Dr. Jean Clottes. Sections have been identified in the cave; the Great Hall of the Bulls, the Lateral Passage, the Shaft of the Dead Man, the Chamber of Engravings, the Painted Gallery, and the Chamber of Felines. The cave contains nearly 2,000 figures, which can be grouped into three main categories - animals, human figures and abstract signs. Most of the major images have been painted onto the walls using mineral pigments although some designs have also been incised into the stone. Of the animals, equines predominate . There are 90 paintings of stags. Also represented are cattle, bison, felines, a bird, a bear, a rhinoceros, and a human. Among the most famous images are four huge, black bulls or aurochs in the Hall of the Bulls. One of the bulls is 17 feet (5.2 m) long - the largest animal discovered so far in cave art. Additionally, the bulls appear to be in motion. There are no images of reindeer, even though that was the principal source of food for the artists. 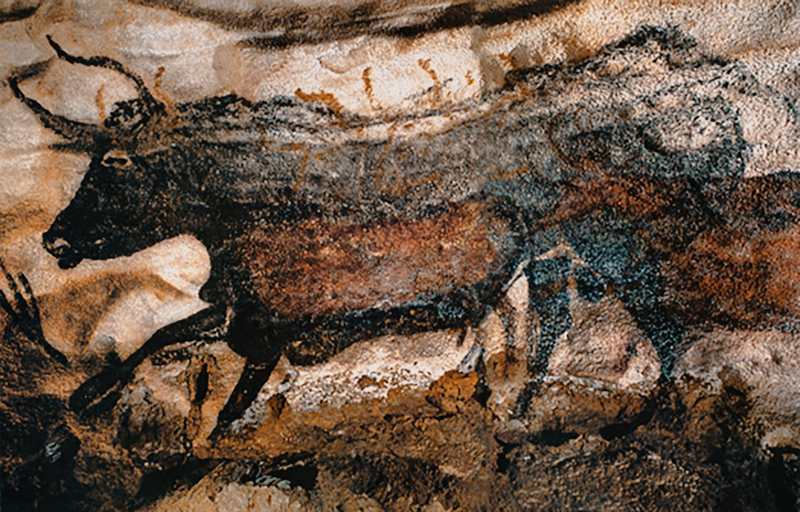 A painting referred to as 'The Crossed Bison', found in the chamber called the Nave, is often held as an example of the skill of the Palaeolithic cave painters. The crossed hind legs show the ability to use perspective. Since the year 2000, Lascaux has been beset with a fungus, variously blamed on a new air conditioning system that was installed in the caves, the use of high-powered lights, and the presence of too many visitors. As of 2006, the situation became even graver - the cave saw the growth of black mold. In January 2008, authorities closed the cave for three months, even to scientists and preservationists. A single individual was allowed to enter the cave for 20 minutes once a week to monitor climatic conditions.